Hello Willa fans! As you must know, a brand new season of Arrow premiered this Thursday and in the episode we got to learn about Thea’s fate post-explosion. As many of us might have expected, things didn’t end well for Thea. Our girl was found by Oliver after the explosion and is currently in a coma. We sure hope Thea wakes up any time this season because after everything she’s been through, she deserves a happy ending. High definition screen captures from the episode have been added to our gallery. Hello Willa fans! With Arrow returning with a brand new season this Thursday, we’re all left wondering what is going to happen to Thea. In conversation with Comic Book, executive producer Marc Guggenheim spoke about the reason why Thea was absent during part of season 5 (which had already been previously justified) and what’s happening with during this new season. Is she going to survive the explosion? Only one way to find out! Whether or not Thea Queen survives the explosion on Lian Yu, actress Willa Holland will be back on Arrow this season. Showrunner Marc Guggenheim, though, hints that some of her episodes could be in flashback. 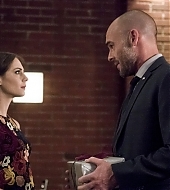 Thea’s absence in the second half of Arrow‘s fifth season was noted by many fans, but Guggenheim told ComicBook.com that it was the by product of Holland’s own request to scale back her time on set. While the explosion at the end of season 5 might seem like the ideal way to get rid of an actor who doesn’t want to be onscreen all the time, Guggenheim has said in the past that he doesn’t imagine that Thea will die on his watch, since Oliver has already lost both parents. So what’s next for the character? Arrow returns to The CW on Thursday at 9 p.m. ET/PT following the season premiere of Supernatural. Hello Willa fans, we bring you something special today! Back in 2004, Willa made an appearance on Asia Argento’s movie The Heart Is Deceitful Above All Things. While her scenes (shared with the Sprouse twins) were apparently cut from the final edit, we got our hands on some on set footage that would later be released on the DVD! In the footage, which you will find screen captures from in the gallery, we get to see Willa shooting a few scenes and just hanging on set with the Sprouse twins. A little fun fact, Willa was around 13 years old when this movie was shoot! Fair to say she doesn’t look to have changed her appearance none a bit over the years (and looks extremely adorable in these screen captures)! ComicBook has just released an interview from Comic Con International featuring Willa! She explains Thea’s focus if she makes it out of the island, Malcolm Merlyn, Oliver’s relationship with his son and more! Sadly the interview cannot be embed, but you can watch it by clicking on the picture bellow. Much of Team Arrow’s fate hangs in the balance after Arrow‘s earth-shattering season five cliffhanger. While fans are uncertain what to expect when the show returns this fall, one cast member has a pretty clear idea of what her character’s motivations could be going forward – if she survives the horrific blast on Lian Yu, that is. Willa Holland, who brings to life Thea Queen/Speedy on the show, recently spoke to ComicBook.com during San Diego Comic-Con. While Holland was not able to reveal what state Thea will be in when Arrow returns in October, she shed some light on what Thea’s primary focus in season six could be. Check it out in the clip above! According to Holland, those bombshells range quite a bit, and include the sacrifice Malcolm Merlyn (John Barrowman) made on Thea’s behalf in the season five finale. Fans will just have to wait to see how Thea processes all of that – and if she is alive and well to do so – when Arrow returns to The CW in October. It has been announced that Willa will be making an appearance at Salt Late Comic Con! The convention takes place in September 21-23, and she’ll be joining co-star John Barrowman! Tickets for the convention can be bought here. A hero’s duty never ends. Is the slogan of the upcoming season of Arrow and the first trailer was released yesterday right before the cast’s panel at Comic Con International! In the trailer we get a recap on the finale episode of season 5, along with some scenes from the new episodes that feature Dinah, Laurel, Oliver, Slade (!!!) and William. 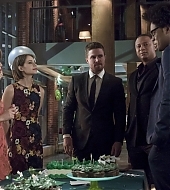 Sadly, no Thea and we only get to see her running after Samantha who is looking for her and Oliver’s son, William. You can watch the trailer bellow. The sixth season of Arrow premieres October 12 at 9/8c on The CW! 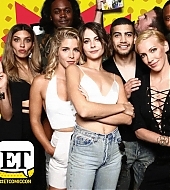 While attending Comic Con International, Willa did some press where she and the cast of Arrow spoke about the upcoming season of the show. Bellow and under the cut you will find all interviews released so far. Make sure to keep an eye out for this post as it will be updated with all new videos! Our favorite time of the year– Comic Con International or as some call it, San Diego Comic Con!!!! It’s a fantastic time where we get learn more about certain television shows, movies and much more. For us, Willa fans, it means a lot of new pictures, interviews and basically just seeing Willa out in San Diego, promoting the show, while being her goofy and super sweet self warms our hearts. 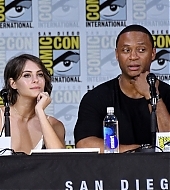 Willa was the convention promoting the sixth season of Arrow, where she spoke about Thea while also not giving much away considering the season five finale ended with a big bang (if you know what i mean) and the fate of a lot of characters is currently under wraps. With that being said, during the panel we didn’t learn much on Thea. Willa spoke about the crossovers and how they were very challenging in a really creative way. The cast was asked about traumas their characters went through this past season only, to which Willa said that trauma has catapulted Thea into different areas and she has learnt lessons of who and what not to be in the future. Photos from this epic weekend have been added to the gallery, from public appearances, to photos of Willa arriving to Hard Rock Hotel and photoshoots. Bellow you will also find a video to the panel, that you can now watch thanks to Flicks And The City! BLACK SIREN RETURNS — Black Siren (guest star Katie Cassidy) returns to help Chase (Josh Segarra). 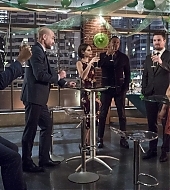 Felicity (Emily Bett Rickards) organizes a birthday party for Oliver (Stephen Amell) while Lance (Paul Blackthorne) is furious after Rene (Rick Gonzalez) misses the custody hearing for his daughter.